Foraging; It’s not all about wandering through summer meadows in your Cath Kidston whellies, basket on arm and the sun high in the sky. At this time of year the best food to be found is down by the sea and for me this is the perfect reason to escape the city and go hunting for some tasty wild goodies just waiting to be gathered, caught, dug up or picked . Not excited by a trip to the seaside on a chilly winter day? No car? No problem….numerous city foraging ideas next month…but for now, the coast. December has just begun and the wild foods I like to pick refuse to all gather together in one convenient spot (how boring would that be), so by far the best way to go hunting is by car, allowing you to visit five or six different areas and environments in a short space of time and get warm again in between each one (a thermos of tea is the best companion you can have on one of these trips). There are far too many wild treats to list and write about so I’ll just include five or six of the best (and most common too, which is lucky) with links to help ID them below and also recommendations of a couple of good coastal foraging guides. For the first item on the menu, head to a shingle beach or the area where the beach runs out and scrubland or brush begins. Sea beet ! A truly delicious ready salted wild spinach, available all year round, growing in big dark green clumps, thick, succulent and hardly reducing when cooked…wash it thoroughly and steam it for 5-8 minutes. It may go black during cooking but should end up a beautiful deep green. Next on our picking list, late season mushrooms. There are still a few field mushrooms and blewitts around so head for an open area of grass land near the coast or right next to it. Snowy wax caps are still around too, nestled into the grass but please only ever pick these with an expert and if you have a bit of mixed woodland close to hand, winter chanterelle will be around all the way to Christmas (see my previous blog for info on these). If you have a good tide table and access to a sandy or muddy beach, it’s an excellent time of year to collect mussels, cockles and various types of clams. Check the water quality of the beach online (blue flag beaches are best), arm yourself with a bucket and a tub of salt and go hunting for razor clams at low tide (see the link below for tips on this…it’s a bit like a seaside magic show, so great to do with kids). 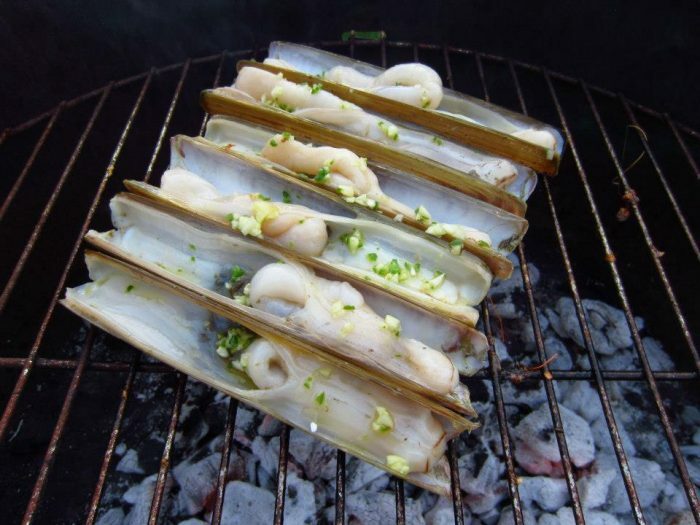 Cook them quickly in their shells with white wine, garlic and herbs and cut away the “stomach” before you eat them. A superb wild food. While you are on the sea shore and if you have a low enough tide, look out for some tasty seaweeds. We have seven hundred varieties around our shores and all but a few are edible (fortunately the three suspect types only occur in deep water). Alas it’s not part of our culture to eat seaweeds but they are stuffed of full of protein, iron, iodine, carbohydrate and anti oxidants as well as tasting delicious fried or in soups. 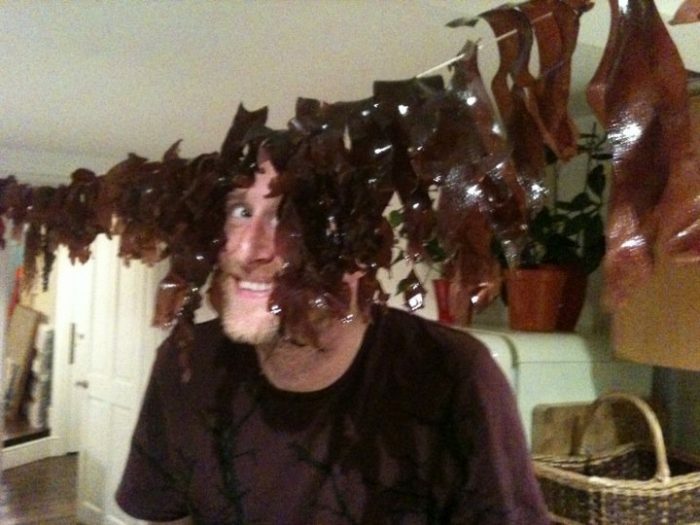 One of the best of these is Dulse, a red ribbon like plant, common all around our coast. Use scissors to cut it off leaving it’s “holdfast” behind so it can regrow and only pick it when it’s attached to the rock and looks healthy (never pick drifting weed). Now head in land a little for these last two wild goodies. Both are plentiful and taste terrific. 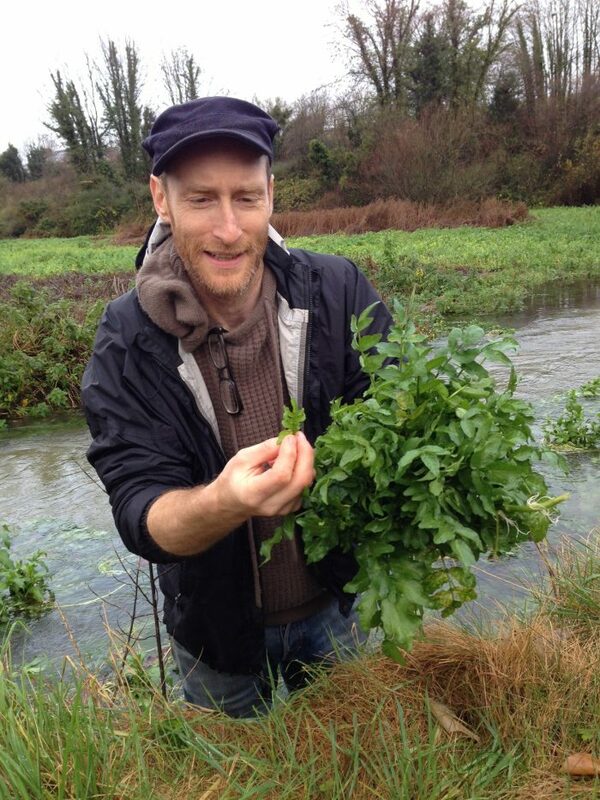 First up, watercress…..one of the good things about this lovely member of the cabbage family is that it only tends to grow in good quality, free flowing water. At this time of year you can find huge swathes of it in shallow rivers but there are a few dangers involved apart from the risk of getting wellies full of cold water. Liver fluke is a dangerous little worm (snail) that lives on livestock poo and likes to hang out on wild water plants causing severe organ problems if ingested. Fortunately it is killed and rendered harmless by cooking so I only ever eat cooked water or river edge plants (not even a nibble to help ID them and wild watercress salad is definitely off the menu). The second risk comes from other plants. Fools watercress, a member of the carrot family, will do you no harm other than tasting a bit disappointing. Water dropwort on the other hand, grows in the same environment, often in and amongst watercress and is Europe’s most deadly plant. A few mouthfuls of this will certainly kill you, in fact you don’t even want to touch it! It’s pretty easy to tell these three apart with a little practise and really their leaves are very different. Just be careful not to get a few dangerous leaves mixed in with the good ones when the foragers greed comes upon you. Lastly, and to complete our meal, Burdock. The root to be precise. People often describe wild food as tasting a bit like this or a bit like that but the best description of burdock is to just say it tastes like burdock and very nice it is too. This plant lives for two years and puts up flowering stems up to six feet tall in the latter part of it’s second year, covered in pinky purple burs ( a bit like thistle flowers, spiky and sticky, tipped with tiny hooks). The time to dig its root up is in the autumn of its first year or spring of its second when all its energies are concentrated below the ground , not above it , so if you see it in flower it will be too late. The root can be very deep indeed, apparently as deep as the plant will be high, but I have never put this to the test and always give up after about a foot or so of digging. I make a doughnut shaped hole around the plant and then, when I can’t be bothered to go any deeper, I cut the middle out and pull up the root, usually leaving some in the ground. 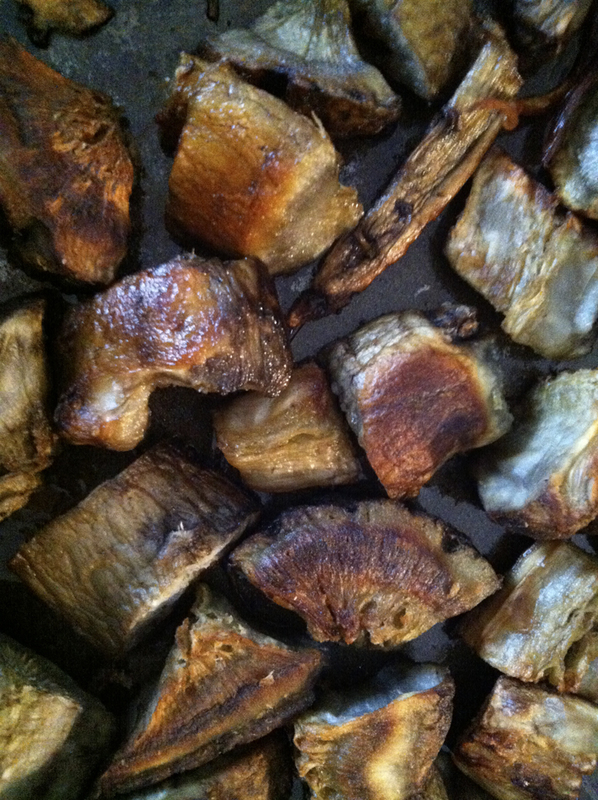 Burdock root is full of starch and is great roasted, boiled or boiled dry with a mix of water and soy sauce. It’s not just a survival food. You need the land owners permission to dig plants up but unlike the rest of these foods burdock is easy to find in urban areas. Everyone in the city has friend with a neglected garden, a patch of old weeds or a communal area. Here you will find burdock, I promise…although I would consider the quality of the city soil in which it grows before making this my staple winter diet. So, there you have it. A coastal winter feast. Watercress soup, fried or baked razor clams, a few wild mushrooms, deep fired crispy dulse, steamed sea beet and roasted burdock…bloody marvellous and all the major food groups covered quite nicely…I’d probably go to the shops and buy a sticky toffee pudding for desert (you have to use all the resources available in winter). Eat The Beach by Frazer Christian…. My one line review ” Frazer is as knowledgable and passionate about coastal foraging as he is dyslexic…both these things are on show in this terrific little book”. Edible Seashore by John Wright…. John gets all the publicity he needs via River Cottage. This is my favorite of his books with great photos too. Next post: When is it a bad time of year to go foraging……never! Previous post: I bloody love mushroom hunting!